You may want to get familiar with this article to get the idea of how cache works: https://code.google.com/p/guava-libraries/wiki/CachesExplained. Here I explain the basic app that accesses data via DAO. Let’s assume that data access is costly so the cache is needed. I want cache entries to expire after specified amount of time. Pretty simple. provide the method to load entry – Guava Cache will call this method when you will try to retrieve the value from the cache for the first time (when entry was not found in it yet) or if requested entry has expired. Here that method makes call to my DAO. expireAfterAccess(long, TimeUnit) Only expire entries after the specified duration has passed since the entry was last accessed by a read or a write. expireAfterWrite(long, TimeUnit) Expire entries after the specified duration has passed since the entry was created, or the most recent replacement of the value. This could be desirable if cached data grows stale after a certain amount of time. expireAfterAccess works different. In opposed to expireAfterWrite, it expires entry if it was not accessed in cache in specified time. So if you constatly read that value within its expiration time, it will not get refreshed. expireAfterWrite expires entries based on its age in cache. So it will be refreshed if validity period passed, no matter how freqently you access it (it is done in lazy way, so if time passed, the value will be refreshed only when requested from cache). The Guava Cache implementation expires entries in the course of normal maintenance operations, which occur on a per-segment basis during cache write operations and occasionally during cache read operations. Entries usually aren’t expired at exactly their expiration time, just because Cache makes the deliberate decision not to create its own maintenance thread, but rather to let the user decide whether continuous maintenance is required. I’m going to focus on expireAfterAccess, but the procedure for expireAfterWrite is almost identical. In terms of the mechanics, when you specify expireAfterAccess in the CacheBuilder, then each segment of the cache maintains a linked list access queue for entries in order from least-recent-access to most-recent-access. The cache entries are actually themselves nodes in the linked list, so when an entry is accessed, it removes itself from its old position in the access queue, and moves itself to the end of the queue. When cache maintenance is performed, all the cache has to do is to expire every entry at the front of the queue until it finds an unexpired entry. This is straightforward and requires relatively little overhead, and it occurs in the course of normal cache maintenance. (Additionally, the cache deliberately limits the amount of work done in a single cleanup, minimizing the expense to any single cache operation.) Typically, the cost of cache maintenance is dominated by the expense of computing the actual entries in the cache. Test mechanism is simple. I set the cache entry expiration time to 5 seconds, and set up a loop to retrieve value from cache each second. Google’s documentation regarding the notifications is here. All the source code for this tutorial you can download here. Thanks to this ID later you can refer to that notification and update its content or hide it when you need it. Now you have a basic notification that can issue certain action. Further customization is optional and introduced in newer versions of Android. Since possibilities are quite big, it is worth to continue improving the notification. Notice that most of the elements are the same, except the 7 – the details list. Remember that big style works only for android versions higher than or equal to 4.2.
notice that fields displayed on small notification are not visible in this style. 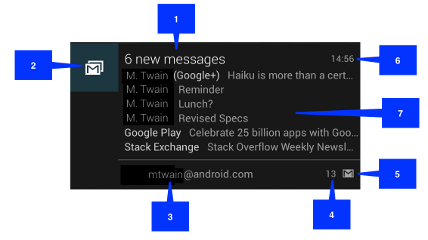 Notification updates are quite simple: just set the fields you want to change with notification builder and call NotificationManagers’ notify() method providing the ID that you assigned to the notification that you need to update. The notification will be updated accordingly. Builder is an internal class that is dedicated to build an instance of a type. Here just param1 and param2 are mandatory, the rest is optional. Effective Java (Joshua Bloch) is a book with advanced Java programming techniques that make Java code more robust and readable. I am currently reading it and this is why these [Effective Java] posts come up here. These are summaries of chapters that are most valuable in my opinion. Static factory method is a public static method that is used to create object – exactly the same as constructor. So when it is better than usual constructor?